We have shared many blog posts about recovery as a process, as a habit that takes daily practice and attention. We’ve talked about the many triggers of relapse, from stress to poor health to depression. Another major trigger for relapse is a feeling of restlessness, of being scattered, of losing control over our circumstances or emotions. Sometimes, a recovering addict might get stuck in painful or frightening memories that seem easiest to erase by returning to alcohol or drugs. In this post, we’ll introduce two techniques, grounding and centering, that can help you return from a place of seeming chaos to a place of rest and calm. You may have heard yoga or meditation teachers talk about “grounding” and “centering,” but what do these terms actually mean? To “ground yourself” simply means to bring your energy and attention from your head and stomach (which are often hotbeds of anxiety, cravings, restlessness, and impulses) to a more stable base: a connection with the Earth. A simple grounding exercise is to place your feet on the floor (or on the ground if you can sit or stand outside) and to imagine roots extending from the bottoms of your feet down into the earth. Imagine the roots burrowing deep into the earth and drawing nutrients from the rich soil. Feel the connection to the earth come up through your feet and legs and into your entire body. Stay with this feeling a few moments, breathing steadily. When you are ready, imagine your roots retracting, and take a moment to feel gratitude for the Earth and for how it supports us. 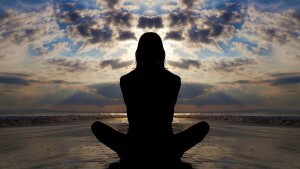 To “center yourself” means to set aside all thoughts of the past and future and to focus on the present moment. It means to take your scattered energy and focus it on your heart. “Heart” in this sense is the center of our feeling nature, the place from which we feel and give love. A simple centering exercise (which can immediately follow the grounding exercise above) is to find a comfortable position, breathe slowly and evenly, and bring your attention to your heart center. Focus on feeling love and compassion for yourself. Remind yourself that you are perfectly safe and that anything that happens to you here on Earth, no matter how bad it may seem, is for your highest good. When you’re ready, extend this feeling of love outward to the world. Feel your connection with others. You may want to end your grounding and centering exercises by giving thanks for any people, things, and events that have contributed to your growth or brought light to your life. Everything I Wanted To Know About Spirituality But Didn’t Know How to Ask, by Peter Santos. This book includes chapters on grounding, centering, meditation, and more. “Grounding Exercises.” Living Well. http://www.livingwell.org.au/well-being/grounding-exercises/. This web page contains a list of 20+ simple exercises to help ground yourself in the present moment.